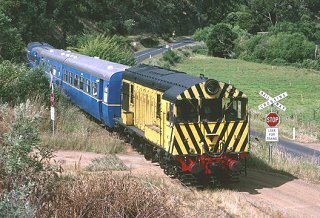 The Derwent Valley Railway Preservation Society was formed with the aim of operating passenger excursion trains on Tasrail's Derwent Valley Line. The society is based at New Norfolk, 38 km northwest of Hobart. Unfortunately no trains are operated at the present time. The collection includes 8 locos, 9 carriages and 11 wagons.